CM Magazine: Some Things I’ve Lost. Toronto, ON: Groundwood/House of Anansi, 2015. 32 pp., hardcover & pdf, $19.95 (hc.). ISBN 978-1-55498-339-1 (hc. ), ISBN 978-1-55498-340-7 (pdf). Grades 2-4 / Ages 7-10. 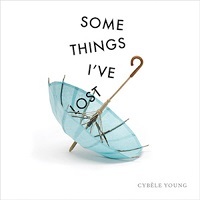 In Some Things I�ve Lost, award-winning artist Cyb�le Young delivers a breathtakingly unique tour de force. On stark white backgrounds, 12 misplaced, everyday objects are itemized. With tongue-in-cheek scientific accuracy, each figure is numbered, identified and its last whereabouts is duly noted: �Fig. 4 OBJECT: Umbrella LAST SEEN: Front porch with the others�. Opening up the facing gatefold reveals a spectacular transformation. In four stages, the umbrella morphs into a giant jelly-fish-like creature. More surprises are in store as a sun visor changes into a sea anemone, a wrist watch becomes a spiky clam, and an empty guitar case blooms into a starfish. This eye-popping, surreal underwater universe has ties to the ordinary world, and observant readers can find the common details, like the lawn chair�s striped lattice strips showing up as patterns on the plant life. Cyb�le Young is known for her intricate sculptures made out of Japanese paper, and her artistry is on full display in this book. The transformations are dynamic, and the energy and personality of each mysterious sea creature is conveyed. Some of the paper sculptures appear diaphanous, lending a delicate, otherworldly quality.